We have already come to the same conclusion. That there exists some giant reptiles in the form of sea serpents at least, out there still making a living. Firstly, they have no natural enemies, do not breathe air, so that they rarely surface at all, and whenever they hear an engine, do the obvious and dive deep. Even better, it appears that they likely live in the deep below the warmer surface layer were they ar most comfortable. This suggests that they come to surface as part of their reproductive cycle. Most likely to enter a fresh water refuge hosting adjacent swamps in order to lay a clutch of eggs in the much as cold blooded reptiles will. Today we discover that multiple sightings exist off the New Zealand Coast. This conforms with the additional occurrence of Age of Dinosaur sightings associated with the Sahul that Northern Australia and Papua New Guinea are part of. This is also most likely were the clutches would be placed. In previous postings I have associated breeding grounds off New England with known fresh water clutching lakes including loch Ness and others. New Zealand likely provides similar environs, though the Sahul will provide nearby warmer conditions should it matter at all. The lakes of interest are listed here and are all in South Island. They are all in Fiordland whose genesis hardly needs explanation and yes they have history of fleeting sightings similar to Nessie. We thus continue to have two separates creatures from the age of Dinosaurs that both live in the Deep and surface only to lay a clutch of eggs in a freshwater swamp. My real difficulty with a living Mosasaur is the present understanding that the creature is an air breather, which would make it as visible as the whale population. It simply has not been that visible. What is more its linage is reptilian as is that of the sea serpent that gets by nicely without breathing air. Thus accepting this creature pretty well tosses out the argument of air breathing and I need to know why this was argued in the first place. The Possiblity of Mosasaurs breeding off the New Zealand Coast. There have been many encounters with unknown creatures off the coast of New Zealand, with the East coast being particularly favoured. These deep troughs bring a wealth of nutrient rich organisms to the surface allowing for a mass of biodiversity to flourish in the nutrient rich upper waters. Krill are profuse here along with smaller fish species which create a nutrient rich environment for larger predatory animals such as Giant Squid, which in turn are preyed upon by Sperm Whales. So there is no deficit of vast food supplies for large predatory animals cruising the depths of New Zealand's coastline. Where the Hikurangi Trench joins up with the Tonga Trench, the area is heavily spotted with areas of geothermal activity which provide warm waters as well as a warm current which flows from the equatorial region. This area of the Tonga Trench has a rich diversity of marine life previously undiscovered until recent expeditions. This is a very harsh environment where reshaping of the seafloor is happening continually, to quote from the results of a joint project between the Universities of Durham and Oxford, and funded by the National Research Centre. "Where the Pacific plate collides with the Indo-Australian plate, it is forced downwards into the trench, a subduction zone, and the volcanoes are carried with it. The trench, reaching a depth of 10.9km, forms the second deepest stretch of seabed anywhere in the world - easily large enough to hold Mount Everest"
What would make this an ideal nursery and breeding place? The abundant food supply, warm, water and lack of large predatory animals would make this an ideal breeding and nursery ground for Mosasaurs. Migrating whales along these routes would also provide a range of suitably sized animals for the young mosasaurs to feed on, and just returning from the feeding grounds would make these whales wholesome additions to their diet. Personally, I think the primary reason that many of these creatures are avoiding detection is the fact that they have learned to avoid the sound of a ship's engine and stay well away from any encroaching vessel or main shipping lane. These out of the way areas often lead to shallow bays which are warmed by the circum-tasmanian current which brings warm water to the Bay of Plenty, which coincidently boarders the Kermedec trench. Warm water, shallow bays and a deep nutrient rich feeding ground create ideal nutrient rich conditions. Likewise a high percentage of creature observations have been made in these very waters. So what has been seen in these waters? 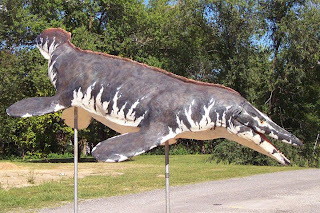 The earliest known reference to Mosasaur like creatures in New Zealand waters comes from a report dated August 1st 1899 from the Union Steam Ships Chief Officer of the Rotomahama, Lindsay Kerr. He reported a huge Conger Eel, except it had two fins, one on each side of the body. This colossus Rose up to a high of 30 feet out of the water. This sighting occurred near the Portland Light situated between Gisborne and Napier. Right in the area of suitable Mosasaur habitat coincidently. When shown pictures of various types of Eels, Mr Kerr said it had a more crocodilian type head rather than anything he was shown. In April 1971 the crew of the Kompira Maru saw a "Bug-Eyed Monster" which resembled a large crocodile, but had fins instead of Legs, which were clearly visible as it leaped and dived under the water. 1972 three women were whitebaiting at the mouth of the Orari River near Temuka watched a huge creature wallowing in the breakers about 30 m away from them. They described a light grey lizard like beast that was around 15 m long, which at one point opened its mouth to reveal numerous small sharp teeth. There is nothing to be said to make me think otherwise but personally, I do believe these creatures are out there as there have been too many sightings that are so closely reminiscent of mosasaurs as to be easily dismissed. There have been 11 reported sightings of Mosasaur like animals reported in New Zealand waters, a higher number than anywhere else. Are they a new species? I would more like to think of a Coelacanth scenario, an ancient species that has adapted to survive into the modern age. We are still but children taking our first unsteady paddling steps into a very wide and portentous ocean that holds many secrets and undisclosed treasures we thought once lost. Lewis, K. B., Collott, J., & Lallemand, S. E. (1998). The dammed Hikurangi Trough: A channel-fed trench blocked by subducting seamounts and their wake avalanches (New Zealand-France GeodyNZ Project (pp. 441-468.). My father and another soldier saw one in a river in the central highlands of Vietnam in 1969. They watched it swim around for over an hour. The other soldier threw rocks at it from the bank. While it rushed at him, it stayed in the water. The locals said my father saw a river dragon. Mynfather drew a picture of it and we sent it to the academy of natural sciences inphiladelphia, the head of paleontology called and said it was most likely a mosasaur. The size was ten meters and my father said the head was huge. He specifically recalls flippers instead of feet. There is nothing like a clear eyewitness report. We appear to have three prospective large denizens of the deep. They all likely breathe through some form of external gill which is why we see comb like structures witnessed at times. The mososaur is an excellent candidate for the Chinese river dragon. the plesiosaur is good for the lake creatures like Loch Ness. and the voutright sea serpent is see mostly at sea. We also now know that live birth for these large creatures is expected lessening the need to come on shore ever. I was once deep sea fishing in the gulf with my father and grandmother. Off the back of the boat, some men were fishing for sharks. One man pulled up a small shark that had scars on its tail. The shape was half-oval and was a row of wide dots. Later, I alone observed some seabirds diving around the last of the chum used to catch the sharks. After it was gone, I noticed something surface. It was like, a large komodo dragon or a monitor lizard, but it was the same color of the water. I yelled and pointed, but it dove, and my father and grandmother just insist it was my overactive imagination. Thanks for sharing. I would love to speak with you directly if you wish. I can interview you and establish a level of credibility. What is clear is that we have an expanding group of deep large sea carnivores rarely observed and always in ambiguous circumstances and yes with only one set of eye balls to see them. Read about an article a while back of Japanese scout ship during World War II operating the South Pacific/Solomon islands encountering a large aggressive animal with dark skin, white underbelly flippers and head like an alligator. It did not mention Mosasaur but in my mind I was thinking it perfectly described this same animal. The creature would ram the vessel, circle back, then ram it again. It got to the point where the bone jarring impacts caused the boat to list to starboard, upon which the shocked and panicked crew opened fire, finally sending whatever it was that had attacked them back into the depths from which it came. There was so much damage to their ship that they were forced to abandon their mission and go back for repairs." My grandfather saw one in a river in Mozambique, during the Portuguese-Colony-war back in the 60's. He still say that wasn't no crocodile, was huge to be a crocodile and was attackin' crocodiles, ripping them off in matter of seconds, he and other two comrades saw it. Only he survived the war, he have seen Jurassic World in television the other day and he started screaming when Mosasaurus appeard, was pretty scare for him. This reminds me that i also expect that the tyrannosaurus rex spends a lot of time in or near water as well. It is nicely engineered to harvest crocodiles as well. The Mosasaur is clearly more flexible in terms of food but both have the horrendous jaws needed. Our error has been to imagine them romping around in vegetation competing with much faster prey and fellow hunters. Yet in the muddy water, they would look like crocodiles from the bank as would the mosasaur. One reason that i suspect they still exist in Northern Australia. I see no reason why it couldn't still exist. Don't get me wrong I have never seen one in real life. But even if the Dino's were killed by a 'meteor' it wouldn't affect water dinosaurs. And if I am wrong please tell me. I personally believe that the flood killed them and the reason why they died out is because the climate changed from tropical to what it somewhat today.